Source: Edgar Pettman, ed., The Westminster Carol Book (London: Houghton & Co., 1899), p. 65. To be sung at the conclusion of a Carol Service, before the Blessing, the people all kneeling. Of His ancient glory shorn. Seated on His Father's Throne. In His Father's house will give. On the rocks for shelter call. 5. Man, of human flesh partaking. Deigned in lowly guise to come. Who again in power shall come. And pronounce th' unerring doom. 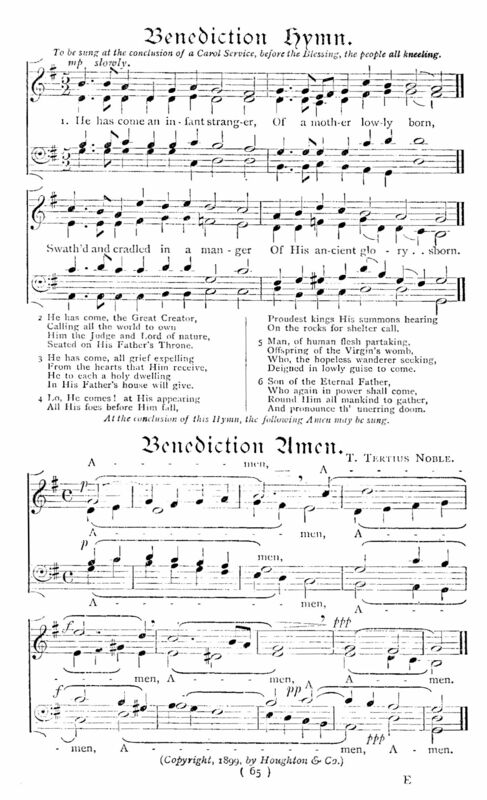 At the conclusion of this Hymn, the following Amen may be sung. Amen, Amen, Amen, Amen, Amen, Amen. Sheet Music from Edgar Pettman, ed., The Westminster Carol Book (London: Houghton & Co., 1899), p. 65.